1989: Montreal's Youppi! 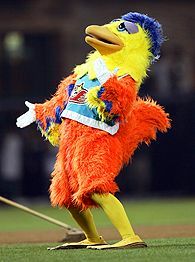 becomes the first mascot to be ejected from a Major League Baseball Game after Los Angeles manager Tommy Lasorda complains about him dancing atop the Dodgers' dugout. 1989: University of Miami mascot Sebastian the Ibis carries a fire extinguisher onto the field, hoping to blast the flaming spear of Florida State's Chief Osceola. Police corral Sebastian, throw him against a wall and empty his extinguisher. The San Diego Chicken got into what turned out to be an expensive episode with a Chicago Bulls cheerleader. 1991: The San Diego Chicken rolls around on the floor with a Chicago Bulls cheerleader, who later sues and is awarded more than $300,000 in damages. 1993: New Jersey Devils mascot Slapshot is retired after the team fires its performer for improperly touching three women while in costume. 1994: The Phillie Phanatic hugs a man at the opening of a paint store. The man suffers back injuries and sues, winning a $2.5 million judgment. 1994: Miami Heat mascot Burnie pulls a female fan onto the court by her legs during an exhibition game in Puerto Rico. The fan turns out to be the wife of a local judge; Bernie is convicted of aggravated assault. 1995: A mascot annus horribilis: Seattle's Mariner Moose breaks his ankle when his skate gets stuck in a turf rut; the Cleveland Indians' Slider tears his ACL after botching a somersault off an outfield wall; Wild Wing catches his skate in a trampoline while attempting to leap over a wall of fire during the Anaheim Mighty Ducks' season opener, possibly inspiring a similar scene in "Old School." 1995: A Detroit Tigers fan sues the team's mascot, PAWS, after he is hit by a foul ball and suffers neck and jaw injuries. The fan claims his injury stems from paying attention to the mascot and not the game; a jury disagrees, and the fan is ordered to pay the Tigers $8,650 in legal fees. 1996: Wisconsin mascot Bucky the Badger is arrested and issued a $141.50 ticket for crowd surfing during a football game. 1996: The Tennessee Volunteer is ejected from the women's basketball championship for jumping on a stuffed Georgia Bulldog; the Bulldog exploded, causing a 15-minute pre-tipoff cleanup delay. 1997: Miami's Burnie sprays Orlando Magic fans with a water gun; sexagenarian Hall of Famer Dolph Schayes decks him. 1997: The San Diego Chicken is sued for "beating up" a Barney the Dinosaur look-alike as part of his act; in court, the Chicken argues that his act is satire and thus protected by the First Amendment. He wins. 1999: The Baltimore Oriole Bird breaks his left ankle after a Philadelphia electrician shoves him off the right-field wall. In a twist, the mascot sues and wins $59,000 in damages. 2000: Florida's Billy the Marlin accidentally knocks an elderly man unconscious with a CO2-propelled T-shirt. 2001: U. of Miami's Sebastian -- and really, what's with this guy? -- earns the 'Canes a 15-yard Sugar Bowl penalty by running onto the field and taunting Florida following a Miami score. 2001: Basil, the mascot for the now-defunct Baltimore BayRunners, blows out his knee while playing air guitar. Craig MacTavish got your tongue? 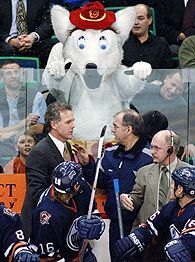 2003: Edmonton Oilers coach Craig MacTavish rips out the tongue of Calgary Flames mascot Harvey the Hound. 2003: Then-Pittsburgh Pirates player Randall Simon clobbers a Milwaukee racing sausage with his bat; Simon is arrested and fined $432. 2004: A woman sues the Butler Bulldog, claiming the mascot tackled her from behind following a T-ball game. 2006: The Stanford Tree is ejected from a basketball game for blowing a 0.157 on a Breathalyzer, nearly twice the legal driving limit in California; a month later, the replacement Tree is suspended from the NCAA women's basketball tournament for dancing in an un-designated area. Patrick Hruby is a columnist for Page 2. Sound off to Page 2 here.